I waste spend quite a bit of time watching American comedy, and in those shows there’s usually a lawyer character. So I came up with an idea for a pretty light hearted blog post – my favourite fictional comedy lawyers! Some of them you will definitely have heard of and others you will only know about if you’re a die hard fan of the show. We’ve also included a poll at the bottom of the page if you want to tell us who your favourite is. Lionel Hutz from The Simpsons is by far the most well known lawyer in this list. He first appeared in season two in the episode Bart Gets hit by a Car. Hutz: Now don’t you worry Mrs. Simpson, I – uh-oh. We’ve drawn Judge Snyder. Hutz: Well, he’s kind of had it in for me, since I accidently ran over his dog. Actually, replace ‘accidently’ with ‘repeatedly’, and replace ‘dog’ with ‘son’. 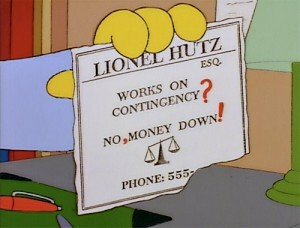 Hutz [voice dubbed in]: To my executor, Lionel Hutz, I leave $50,000. Hutz: You’d be surprised how often that works, you really would. Hutz: And so, ladies and gentleman of the jury I rest my case. Judge: Hmmm. Mr. Hutz, do you know that you’re not wearing any pants? Hutz: DAAAA!! I move for a bad court thingy. 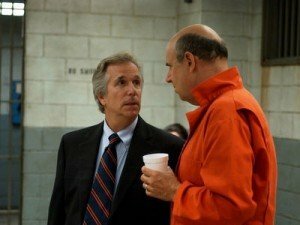 There are 3 hilarious lawyers in Arrested Development – Barry Zuckerkorn, Bob Loblaw and Wayne Jarvis. However Barry Zuckerkorn (played by Henry Winkler, yep – the Fonz!) is my personal favourite. Michael: We need to speak to you about getting a divorce for Gob. Barry: Well, I got Michael out of his marriage, didn’t I? Barry: You’re kidding me. I’ve been taking credit for that for years! Barry: Unfortunately, it’s a private stock, so you cannot just buy up the shares unless someone is willing to sell. Barry: That’s what they said on “Ask Jeeves”. Narrator: In fact, Barry had lost George Sr.’s will. Barry: …how did I get here? Harvey Birdman is pretty hard to describe. It’s all about a law firm – Sebben & Sebben, which is full of superheros and characters from Hanna-Barbera (The Flintstones, Shaggy & Scooby and Secret Squirrel are just a few of those featured). Birdman is the main character; apparently he was tired of fighting crime and wanted a career in law instead. Harvey usually plays the role of a defence lawyer. In one episode Harvey needs to defend himself against and old nemesis who is suing him for injuries caused during a fight from his superhero days. Marshall Eriksen is from How I met your Mother and throughout the show we see him graduate from law school and move on to being a lawyer. He’s probably the only lawyer on the list who isn’t wildly incompetent! While his character doesn’t just revolve around him being a lawyer there are lots of funny moments which occur during his time at work. The video to the left is a clip from one of the episodes – a law school band Marshall forms called The Funk, the Whole Funk and Nothing but the Funk (sorry about the poor quality). Barney: Statistically, men who have had at least one relationship with a prostitute, are 75% more likely to have success in future relationships. Marshall: You made that up. Jack Kelly is from a show called It’s Always Sunny in Philadelphia. He’s the uncle of one of Charlie Kelly; one of the main characters. He’s certainly the creepiest lawyer on this list. He doesn’t like his hands being photographed. Also known as Kyle’s dad from South Park. There are several episodes where his legal career comes up. Like the Sexual Harassment Panda episode where everyone tries to sue the school. Our second bird based lawyer. This time from Futurama; he appears in a few episodes when legal advice is needed. Unfortunately he’s not very good. I don’t actually know if that character has a name, so I’m just going to call him the bird lawyer. All I know is that he is some sort of bird which has evolved to the stage where it can speak. And obtain a law degree. Also he sounds like he’s from Texas. Anyway the video to the right is him in action. Judge Dredd should get an honorary mention. Although I do question the amount of legal training he’s received.